We have taken over the Neighbourhood Watch Scheme for the Uplawmoor area and due to the continued break-ins and suspicious vehicles, we have been speaking to the Police and Community Wardens. Neighbourhood Watch Area window stickers are available free of charge from us (also in the Mure Hall and Church Hall). 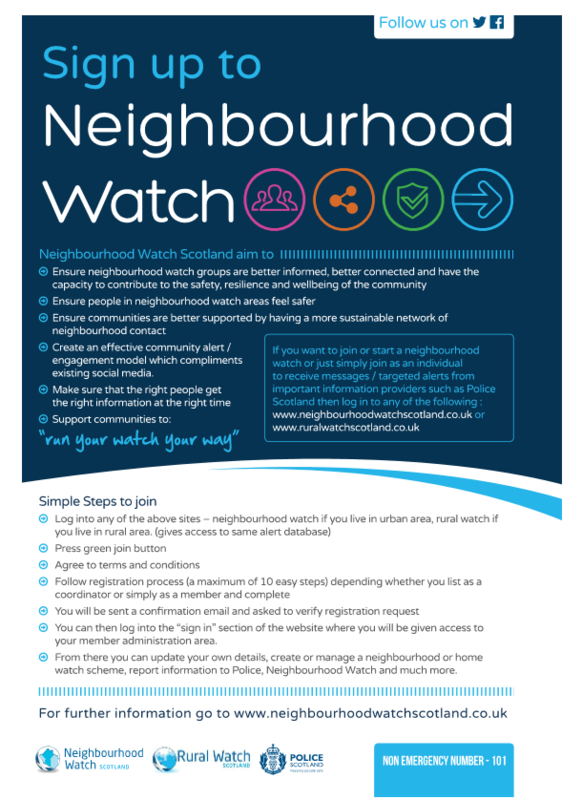 The purpose of the Neighbourhood Watch Scheme is to pass on information to residents from the Police and Council as quickly as possible and to act as a deterrent to potential thieves. To do this we need as many people as possible to up to the alerts in the Uplawmoor area – Click this link to go to the sign-up page! We have sourced Neighbourhood Watch Area window stickers which are available to all residents free of charge from us, the Mure Hall or the Church Hall, we have also ordered Neighbourhood Watch Area lamp-post signs which will be put up at each of the entrances to the village. The reporting police officer at our meeting confirmed that each of the 3 shifts that the police have each day is tasked with patrolling through Uplawmoor – this is often done by plain-clothes officers in an unmarked car. Their advice is for people to start a routine of checking and locking all vehicles, then working your way inside and checking and locking all doors and windows. If you are going away, don’t publicise this and tell only 1 or 2 neighbours so that they can keep an eye on your property for any suspicious goings-on.